More Bestsellers Attending New 2 Week-Long LitFest 2016 – Emirates Airline Festival of Literature. 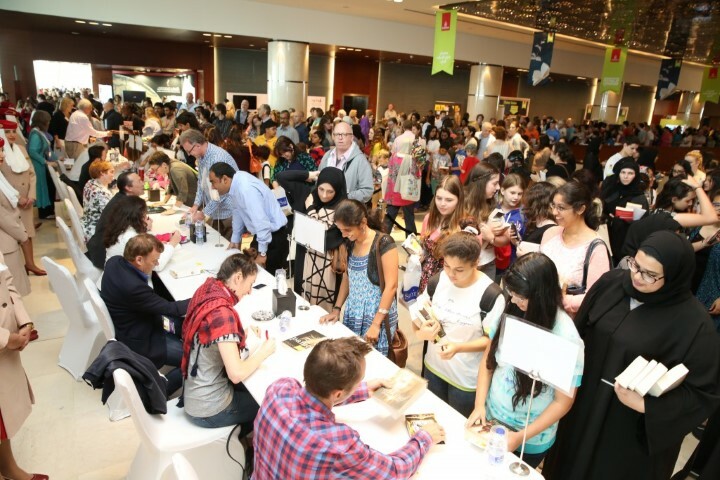 Dubai, 24 August, 2015: The Emirates Airline Festival of Literature has announced that, due to unprecedented author interest, the 2016 Festival will now take place over two weeks from 1-12 March. News of the expanded event was released by the organisers who also disclosed 12 more names of authors who will be appearing at the literary extravaganza. Tunisian-born Al Mabkhout’s writings have featured in journals across the world and his first novel The Italian won several literary prizes including the International Prize for Arabic Fiction. British politician, Michael Dobbs, has written a number of political thrillers but his name is most familiar for his novel House of Cards, which stars Kevin Spacey in the Emmy winning TV series.The announcement comes on the heels of the Festival’s first-time move to release 12 author names every month till the official launch in October. The newest additions to the 2016 guest list include House of Cards author Michael Dobbs and 2015 IPAF-winner Shukri Al Mabkhout, two award-winning authors who will be visiting the Festival for the first time next year. The opportunity to see international award-winning poets, John Agard and Simon Armitage will delight the large number of poetry enthusiasts who flock annually to the Festival. Agard, a playwright, poet, short story and children’s writer, has a unique style, ably demonstrated in his famous poem Half Caste. Armitage, who was recently elected Professor of Poetry at the University of Oxford, was named Millennium Poet in 1999. Fans of Maha Gargash, Emirati documentary filmmaker and author of The Sandfish, will be thrilled to find out more about her new book – a family drama set in the Emirates. Saud AlSanousi, from Kuwait, and winner of the International Prize for Arabic Fiction in 2013, returns with a new novel, Mama Hissa’s Mice. There are likely to be many thought-provoking sessions at next year’s Festival with Chris Cleave and Ghada Karmi captivating all those attending their sessions. Cleave’s bestselling novels capture the experiences of ‘refugees, the bereaved and the embattled’, while Palestinian writer Karmi’s memoirs revolve around life in her home country. Jenny Colgan is a versatile writer, stepping across genre boundaries with consummate skill. Her romantic comedy novels include Summer at Little Beach Street Bakery; she has also written a page-turning sci-fi novel, Resistance Is Futile, and, of course, Dr Who fans will be familiar with her work on the Dr. Who novelDark Horizons. She will also be delighting younger readers at the Festival with her story of Polly and the Puffin. Katie Hickman adds to the growing list of history and travel writers at the 2016 Festival. Her most recent works are the highly-acclaimed novels The Aviary Gate and The Pindar Diamond, part of a trilogy set in early 17th century Constantinople and Venice. Linguistic expert David Crystal, author of more than 100 books on language, will enlighten audiences on the power of words and the richness of language, while Nick Arnold, celebrated writer of children’s science books Horrible Science and the Wild Lives series, will feature prominently in the children’s programme. Previously, the Festival organisers had shared the names of 24 authors, including Hoda Barakat, Ann Cleeves, Carol Ann Duffy and Ian Rankin. A final list of twelve authors will be released in September, a month prior to the grand launch of the complete authors list. All information about the Emirates Airline Festival of Literature is on-line. Check for updates at www.emirateslitfest.com. Join us on Facebook (www.facebook.com/emirateslitfest), Twitter (www.twitter.com/emirateslitfest), Instagram (http://instagram.com/EmiratesLitFest) and YouTube (http://www.youtube.com/user/EmiratesLitFest) for competitions and more updates.